Last year proved pivotal for the Russian air transport sector, which reported negative operating results for the first time since the economic crisis of 2008–09. The period of intensive growth had ended, and carriers found themselves in a new market situation. Back in 2010-12, the Russian air transport market was growing on the back of a favorable economic situation. 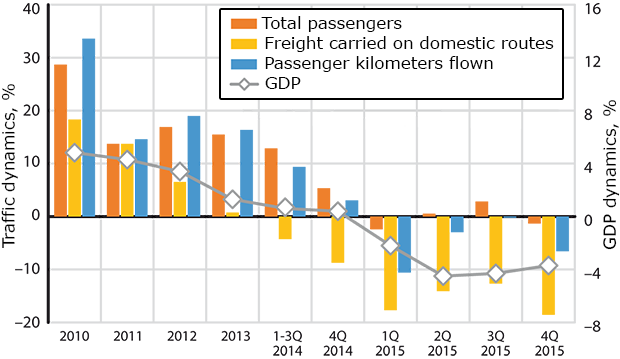 The current crisis was preceded by an abnormally high, sometimes double-digit growth rate in passenger numbers in 2012–14, despite a slowdown in GDP growth. This was to a great extent due to a decline in the actual transportation costs, which brought carriers’ revenue rates down. In effect, airlines were subsidizing their passengers by offering inexpensive airfares. In constant prices, calculated with the use of the GDP deflator formula, the passenger-kilometer cost was 36% lower in 2014 than in 2009. The Transport Clearing House estimates that the sector’s net loss amounted to 51.5 billion rubles ($806 million at the current exchange rate) in 2011 through 2014. Most carriers put their growth rate above their revenues. Until 2013, this growth was mainly supported by the high-yield international air services. In 2013, and especially in 2014, when the ruble exchange rate slumped, domestic services with their considerably lower per-seat profitability became the primary growth driver. For a long period of time most of the Russian airlines continued chasing passenger numbers to the detriment of profitability. These carriers’ reaction to the growing demand was to expand their fleets in order to retain and increase their market shares. Profitability, on the other hand, remained low and often even negative. Excessively focused on offering low fares in a bid to stimulate greater demand, airlines failed to appreciate the risks of a possible market slowdown. Starting in the fall of 2013, experts were repeatedly warning the industry about the high risks of potential stagnation, and even recession, due to the exhaustibility and unreliability of the primary growth drivers. 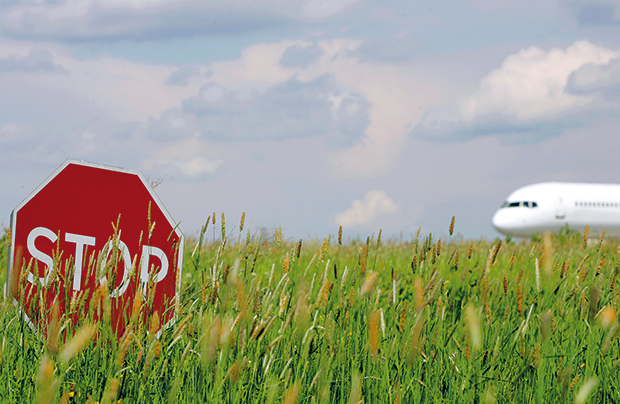 Nevertheless, almost all the Russian air transport market players ignored these warnings. At present, the external market drivers appear to have largely exhausted their potential. negative consumer expectations prompted by the onset of the current economic recession, which resulted in fewer early bookings (meaning a negative cash flow from operations) and in a generally weaker demand for air travel as Russian citizens started giving up on discretionary expenses. The market’s began to slow down in 2013, which generally coincided with the negative macroeconomic dynamics. Up until early 2014, however, the growth rate remained in double digits, giving some market players cause for unfounded optimism. By the end of that year the market began demonstrating signs of stagnation, followed by a drop in airline profits in early 2015. The decline in demand flattened out by Q3 2015 (see Fig. 1), primarily thanks to the growth in the popularity of domestic air services, which was largely due to the artificially low air fares (not least thanks to Transaero’s pricing policy). In August 2015, it became obvious that this growth source had no further potential to be exploited. One of the few remaining market drivers back then was the fact that railway passengers continued to switch to airlines. However, the growth in long-distance railway passenger numbersobserved in the first half of 2016 indicates that this trend might soon be reverted. Air carriers began to actively reduce their seating capacity last year. This was especially manifest in the regional segment, where 36% of all aircraft had been taken out of operation by May 2015 (see Fig. 2). On the other hand, the overall available capacity remained excessive until late summer 2015. This situation could not but result in a serious market crisis. The victims of that crisis were Transaero Airlines, which folded in October 2015, and UTair Aviation, which was forced to reduce its seating capacity by 39% by taking nearly half of its fleet out of operation (only 64 out of the original 117 aircraft remained). The capacity reduction had a positive short-term effect on the sector’s economics, but it is as yet too early to assess its long-term effects. These fundamental changes, which affected two out of Russia’s four largest airlines, considerably reshaped the Russian air transport market competition. The full extent of this will be impossible to assess until two to three years from now. The new market landscape will lend itself to analysis only after the Russian economy in general has emerged from recession. In between the current economic crisis and the previous one, the Russian air transport market was in transition from a notionally competitive modelto an oligopolistic one. Aeroflot Group, the market leader, was growing at 100% in that period, but the strongest rivals (Transaero. S7 Airlines, and UTair) were preventing it from uncontrolled price hikes: each of these carriers’ pricing decisions had a serious effect on the competition’s pricing policy. 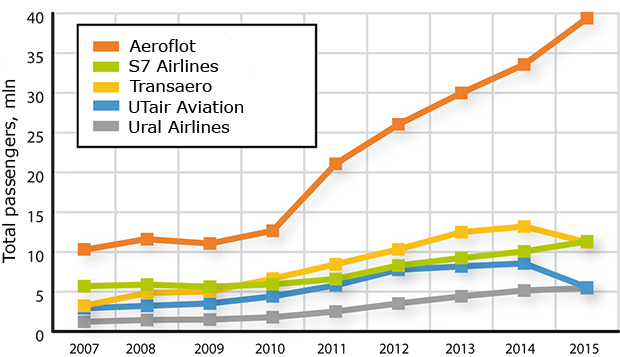 Nevertheless, Aeroflot Group continued to increase its market share (see Fig. 3) at much faster a pace than the other players, first of all thanks to the 2011 consolidation of Rossiya – Russian Airlines and OrenAir under the Aeroflot brand, and also through the establishment of Aurora Airlines. It should be noted that the group’s high overall growth rate was not due to Aeroflot’s performance alone; the other affiliated carriers also demonstrated growing passenger numbers. Thanks to the fast-paced market, many Russian airlines managed to demonstrate growing passenger numbers even despite the fact that their market share was shrinking. In the high-yield international segment, Aeroflot Group was growing even faster than the competition, thanks to the current system of intergovernmental agreements governing the allocation of city pairs to designated carriers. This system secured the group presence on many of the busiest and most appealing international routes. By 2013, Aeroflot Group’s share of the scheduled international passenger segment had become unreachable by the other market players: Aeroflot’s share was nearly six times as big as that of its closest network rival S7. Given Aeroflot Group’s growth dynamics, and counting in such additional factors as overflight payments and commercial rights under intergovernmental agreements, we may assume that it could have continued to increase its market share in the medium term even if the market landscape had been preserved unchanged. As of June 2016, Aeroflot Group was controlling 55% of the Russian air transport market (not counting the foreign carriers operating into the country). If the crisis continues, Aeroflot Group is expected to continue expanding its market share in the near future, especially if some of its rivals cease operations. S7 Airlines can fall back on certain reserves, but the disparity in the two airlines’ business volumes, and also the fact that Aeroflot is the beneficiary of hefty overflight payments, will certainly enable the latter to impose its competition strategy on S7. In the current crisis situation, the overall positive effect produced by Transaero’s bankruptcy on the sector may soon wear off, and if the recession continues for two or three more years, then S7 may find its current reserves exhausted. We may assume that any market competition in the current situation would largely be thanks to Aeroflot’s goodwill. Apart from the general risks of lower efficiency and growing air fares involved in Aeroflot possibly turning into the monopoly player on the market, there exist potential threats to the industry in general. Airports and certain service providers have already had their first encounters with the effects of monopolization in the form of declining passenger numbers. MRO providers, lessors, and other market players may be facing similar problems in the future. Based on the above, we may conclude that the current market development model is fraught with high risks for both the industry and passengers. Any of the possible alternative strategies, on the other hand, would imply a number of serious challenges, and would generate risks of its own. In general, the Russian air transport sector is faced with a choice of different bad scenarios, and any attempts to change the current competition landscape (or indeed failure to to so) entail serious risks. That said, the sector needs to decide on a new market development vector, one that investors and regulators alike would keep in mind when making strategic decisions. Until 2006, Russian carriers were not allowed to operate freely on certain routes. In 2007, the licensing requirement for these routes was lifted, thus doing away completely with government regulation in the domestic air transport segment and resulting in cut-throat competition between the domestic carriers. This, in turn, led to a re-distribution of the market players’ roles, stimulating market consolidation and facilitating the establishment of a quazi-oligopolistic market model. Money paid by foreign carriers for the right to overfly Russia.